I don’t believe a feminist world view requires me to unsubscribe from that which is feminine. I am a feminist (a feisty one) and a pole dancer (a sassy one). I don’t consider these aspects of self to be in conflict. For the sake of context, I am by no stretch a feminist scholar. Feminism and pole dance have many different interpretations and mean different things to different people. 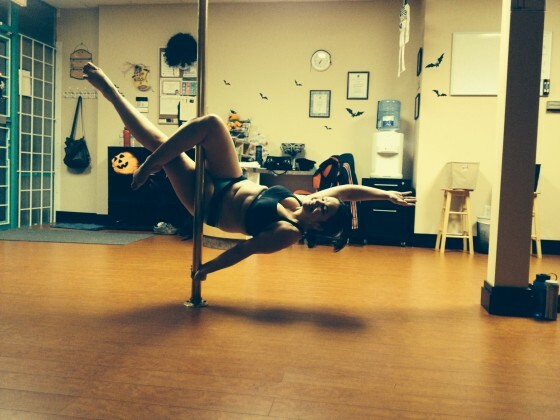 I discuss pole dance from a recreational perspective as a student and instructor. I neither represent nor disparage the exotic industry, but I also don’t have enough information to comment on it. I didn’t begin my pole dance journey as any form of feminist statement. I didn’t evaluate my initial participation from a feminist perspective to assess its congruence with my world view. It’s a form of fitness for me, interchangeable in many ways with spin class. The pole is my fitness apparatus. When I hear a man say something like “Damn girl, I would love to see you work a pole,” I snicker inside because mentally that translates to “Damn girl, I would love to see you stomp the heck out of a StairMaster” (which is a very weird thing to say). Likewise, when I approach a treadmill, I do not first pause to inquire if Gloria Steinem would approve. I just run. I do it because it makes me feel good and it improves my health. It also makes me strong. While pole dance may be viewed sensually and some might argue it encourages objectification, I frequently receive feedback around functional strength. “Wow, you must be really strong.” This is especially true as it gains legitimacy as a sport and fitness activity in mainstream culture. It can also be the antidote for self-objectification, a self-imposed barrier just as limiting as objectification by the outside world. Through pole dance, I re-framed how I see my own body in terms of ability and athleticism versus something decorative to be looked at. I want to keep my body safe because it can do amazing things. Beyond an athletic display, pole dance is a form of artistic expression. Art is an expression of self. Feminism is an affirmation of self. Feminism empowers me to share who I am, and pole dance is the artistic medium I employ to do so. Costuming, music, the tricks and poses I select, these are all paints in the palette to compose my self-portrait, with the pole as my canvas. As an artist, I choose the elements that I display. I control the pieces of myself that the audience sees through my expression. Exposure is a sticking point in the discussion over whether pole dance can be considered to be valid from a feminist perspective. Depending on what is being attempted, exposed skin can be crucial. It is the grip required to perform interesting and beautiful movements safely. Bare flesh ensures I don’t slide unexpectedly off the pole, or at least allows me to control the velocity of my descent. It allows for contact points, which are necessary (imagine the frustration of trying to remove the lid off of a very large jar wearing mittens, or how quickly you slide on a bare floor in socks). I expose skin for safety reasons but that doesn’t mean I’m otherwise ashamed. Excessive modesty of my “flaws” would prevent me from doing something I enjoy. I don’t have a thigh gap and that’s OK. Strong thighs are what I hang upside down from, so no gap means no falling on my head. Out of necessity, I adopted the attitude that parts of me are squishy and parts of me are toned, and I am not going to stop dancing because my body might not meet someone else’s standard of beauty. I don’t believe a feminist world view requires me to unsubscribe from that which is feminine. I love pole dance for the same reason I love pinup art and vintage clothing: an ability to express playful, exaggerated femininity. I can make shapes and perform movements that accentuate that which I see as feminine about myself. I consider the base architecture of a spin to be a glorious celebration of curves. I get to do it in a way that is strong and powerful, and I consider that to be an artistic and athletic feminist expression. I am proud to be a feminist. I am proud to be a pole dancer. Alison Tedford is a data analyst, a blogger, a pole dance instructor, and an eating disorder support group facilitator. She is a single mom of one and you can follow her adventures on www.sparklyshoesandsweatdrops.com or Facebook. At What Age Can I Stop Caring About Being Beautiful?